Note: For some reason we both had a real hard time recalling what we did today, and we didn't take any photo's using our cameras! So this entry is going to be short! I'll try and work some images in though. Sorry! Our original plan for today was to spend most of the day exploring the rest of Kobe, before catching a late afternoon train back to Tokyo. However, since we had managed to fit in so much yesterday, and there was still a fair bit we wanted to do in Tokyo, we decided to change plans and catch an early morning train to Tokyo instead. We had already reserved our seats last night and had to be at Shin-Kobe before 06:51am. Unlike all the other cities we’d stayed at (excluding Tokyo), we were not located within walking distance of the main station and we needed two transfers to get to Shin-Kobe from our closest station of Motomachi. Located a little further away (five minutes walk) though, was the Kencho-Mae subway station which we could use to get a subway directly to Shin-Kobe. Considering that if we caught a train from Motomachi station to Sannomiya station we’d have to walk a fair distance to transfer anyway, it wasn’t too bad. Still, it was a fairly hurried fifteen minute rush up to Kencho-Mae station. In our effort to leave so early we had skipped having breakfast in the hotel and instead grabbed a take away breakfast meal each at a McDonalds we passed on the way. I think we both got a bacon and egg muffin and an orange juice. With all our rushing we actually managed to arrive pretty early at Kencho-Mae station and we were actually there before the train preceding ours arrived, so we could afford have a bit of a rest. We used this time to catch our breath and eat the food we had bought. Since it was an early Sunday morning the subway station was pretty much deserted, although there were more people than yesterday. We bought our tickets from one of the machines on the wall and before long our train arrived. 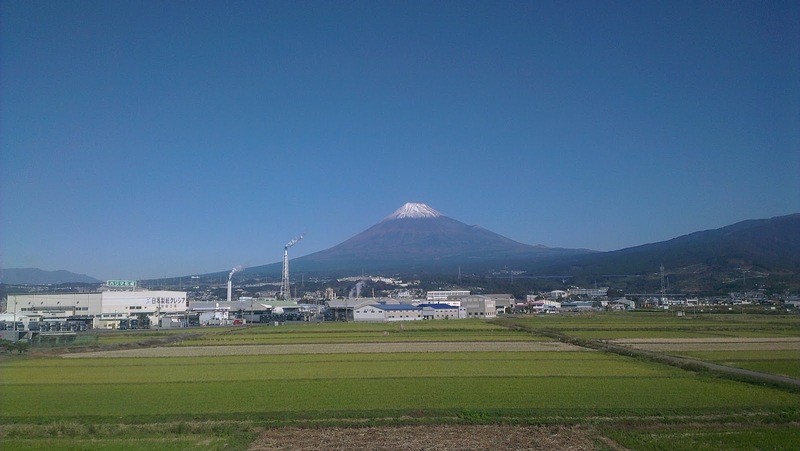 Once we reached Shin-Kobe we transferred to the JR Shinkansen lines and caught our Kodama to Shin-Osaka. We hadn’t actually got a Kodama before and for some reason I had pretty negative feelings towards them. Since, among the Shinkansen, they stop at the most number of stations; I’ve always thought of them as the stupid slow trains! The reality though was that it was plenty fast enough and we arrived at Shin-Osaka only about ten minutes later. Once at Shin-Osaka we transferred to a Sakura and settled in for the long three hour journey to Tokyo. I spent most of the time on the train studying my Anki cards and, as the reserved section was full of lots of noisy people and I was having a hard time concentrating, I actually ended up moving right down to unreserved section at the end of the train. Since Kate was watching TV and wasn't really bothered by the noise, she stayed in the reserved section. The unreserved section was nice and quiet and since there were barely any people down there I wasn’t taking a seat from anyone. 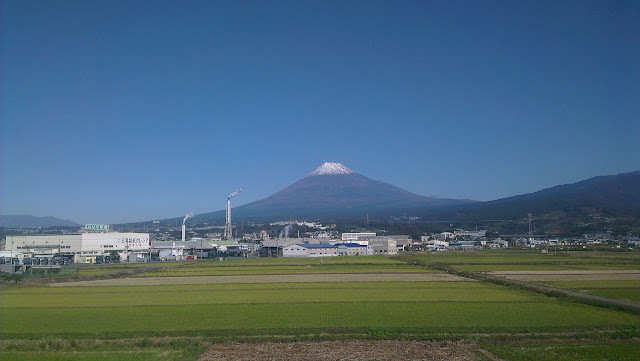 When we were almost at Tokyo the driver announced that we were driving past Mt. Fuji and it was very clearly visible out of the left windows! Unfortunately I was sitting on the right hand side of the train, but I managed to get a view through the left side door- I actually even managed to snap a quick photo with my phone camera! I'm quite happy with my shot! The usually shy Mt. Fuji was quite the exhibitionist today! A relatively short time later at 10:10am, we pulled into Tokyo Station! We were staying at Hatchobori again so we made the long ten minute transfer down Keiyo Street to the Keiyo line and got off one station later at Hatchobori station. Since it was still pretty early we couldn't check in but we were able to leave our luggage with the hotel with no problems. However, as it's a pretty small hotel and reception is tiny I did wonder where they'd be able to store our luggage. With our luggage out of the way we were now free to explore Tokyo! After all that rushing though we were unsure about what we actually wanted to do today! However, one place we did want to check out was Ikebukuro, so we caught the train back to Tokyo Station, made the long transfer to the Yamanote line and arrived at Ikebukuro about half an hour later. The trip took half an hour as Ikebukuro is located on the other side of the city. Ikebukuro (池袋 = Pond + Bag) is one of the many centres of Tokyo and the station handles over 2.7 million passengers a day- which is more than the number of people living in the greater Brisbane area! This makes it the second busiest station in the world after Shinjuku, which is another one of Tokyo’s city centres. In fact, the top ten busiest stations in the world are all located in Japan and out of those, seven are located in Tokyo. There were a few things we wanted to check out in Ikebukuro and first up was Sunshine City. Located not too far from Ikebukuro station and composed of a number of buildings, Sunshine City is considered to be Tokyo's first example of a 'city within a city'. The term comes from the fact that these areas can be thought of as a self contained mini city and include shops, restaurants, hotels, residential space, offices and entertainment all located within the same complex of buildings. Since Sunshine city was first built in 1978 a large number of other similar facilities based on the same concept have been built, with Roppongi Hills and Akasuka Scans as some more recent examples. The main reason we wanted to visit Sunshine city was that its main building, the Sunshine 60, has an open air observation deck located at the top, 240 meters above the ground. While we'd been up to many observation decks in Tokyo before we had yet had the chance to be outside! After making our way to Sunshine City, we found the elevator and caught it up to the top floor where we bought our ticket. There were supposed to be two levels at the top with the indoor lower level connecting to the higher outdoor level. To our disappointment though, we found that we could not get to the outdoor floor! We looked absolutely everywhere and did see a number of places where it looked like there were stairs leading up to the roof but they were totally closed off! There were no signs about the place either, so it looked it had been in this state for quite a while. The bottom floor was still pretty good though and with its big windows all around the outside, we were able to experience great views of Tokyo. A number of the windows had platforms that you could use to get right up to the edge of them- which was scary! And cool! In the distance Mt. Fuji was just barely visible; there was a little haze which was making it hard to see. We saw it clearly many times from Tokyo during our last trip though. Towards the north we could see a really tall and skinny structure which was the main chimney of the Toshima Incineration Plant and at 202m tall, is the tallest incinerator chimney in the world. Towards the middle of the floor there were also a large amount of comfy chairs we had a bit of a rest on. One final thing of note about the Sunshine 60 observation floor was that there was a lot of Tiger and Bunny promotional material around. I'm not really familiar with Tiger and Bunny, and I have no idea why it was around everywhere. In another part of Sunshine City there is a large aquarium that we wanted to go visit, we ultimately decided against it though as we thought it was a little too pricy with entry at 1800 yen each. Our next item of business in Ikebukuro was to check out one of Tokyo's three pillars of Moe and Otaku culture: Otome road. Strictly speaking Otome road doesn't contain much Moe as its main target audience is Fujioshi (腐女子 = rotten + girl + child) , which has resulted in the street being referred to as "Fujoshi Street". Unlike Akihabara and Nakano, there are not a huge amount of shops and the street is otherwise pretty normal looking. In the area there's a Lashinbang, Mandarake, K-Books, and an Animate. The Mandarake and K-Books both contain extensive collections of doujinshi (同人誌 = same + person + magazine = fan published magazine), while the Animate and Lashinbang also contain character goods and other items. The Ikebukuro branch of Animate on Otome Road is actually the flagship store of the Animate chain of stores which, with over 90 stores, is the largest retailer of anime/manga/games in Japan. We wanted to look at the Animate first, but when we arrived we found it had moved and there were attendants out the front distributing maps to its new location. Since it was in a different location to everything else we decided to check out the other shops in the area first. After having a quick look at the Lashinbang we then popped into the K-Books and the Mandarake, which were both full of girls and had copious amounts of doujinshi. We also had a look in another smaller K-Books, but it seemed to be just full of trading cards and didn't contain much interesting to me. After we'd looked in those shops it was time to track down the Animate! Since we'd wandered away from its old location we had a little trouble working out the map but we did eventually managed to find it. As expected of a flagship store, the Animate was really huge and had eight floors! We probably spent about an hour and a half working our way down from the top floor looking at everything. We started from the top floor and worked our way back down. The top two floors were filled with a large amount of anime DVD's and CD's; it was fun looking at the actual CD's of some of the music I had. The fifth and sixth floors were filled with character goods such as folders, figurines, posters and mouse pads. The next three floors were filled with Manga and the bottom floor had new and speciality products (like food), as well as magazines. Although I found many of the items available interesting I realised that I was only really interested in buying Manga since I’d be able to get a fresh perspective on Anime that I like, and they’d help me practice my Japanese. Since I thought I'd be able to get those much cheaper from the Mandarake stores in Akihabara and Nakano, I didn't buy too much. I did get another Hidamari Sketch and a K-On though as I couldn’t help myself! The K-On came with a free little poster as well. I was also considering a mouse pad for while but couldn't really find one I really wanted. After Otome Road we went and had a look in the nearby Tokyu Hands which is a department store with an emphasis on DIY projects, art and craft. Some of the products for sale included: stationary, costumes, travel supplies, pet supplies, hardware, tools, painting, kitchenware, drawing and calligraphy supplies, lighting, appliances, boxes and do it yourself kits. We worked our way up the many floors and Kate bought a cute Winnie the Pooh bear shaped condiment dispenser in the kitchen section. On the eighth floor at the very top there was a pet section and the Nekobukuro cat cafe! Nekobukuro is a special area which you pay by the hour (¥1000/h) to be able to be with about twenty cats that are free to roam around. The name comes from combining the Japanese for the location, Ikebukuro and cat, Neko. The bukuro part of Ikebukuro actually means bag (Ike means pond), so Nekobukuro could be translated as 'a bag of cats'. Nekobukuro is one of a number Cat Cafe's around Tokyo which have been established to give people the chance to see and play with cats in situations where they are unable to keep pets themselves, for reasons such as work constraints and/or strict conditions imposed by landlords. After Tokyo Hands we went to have a look at the department stores that are located on either side of Ikebukuro Station. The two major chains, Seibu (西武 = west + warrior)* and Tobu (東武 = east + warrior)*, are in fierce competition with each other and, given their names, are actually located on the opposite sides of the station you'd expect. Seibu is located on the east side and Tobu is located on the west. *While the’武’ (bu) in both Seibu and Tobu means ‘warrior/military/arms’ it is actually just an abbreviation of the old Province of Musashi (武蔵国 = musashi kuni) which formally occupied land that is now part of the Tokyo, Saitama and Kawasaki prefectures. Furthermore the name Musashi only uses those characters for their phonetic properties, rather than their meanings, and the name likely came from Ainu language. We ended up just having only a really quick look in Tobu as the stores looked pretty expensive and we had already done a fair bit of shopping already. While we were over the Tobu side I bought a honey and banana smoothie from a little cart near the station. After Ikebukuro, our next destination was Shibuya, and we caught another Yamanote line train and arrived at Shibuya station about sixteen minutes later. While we were on the train Kate said she'd like a coffee. I remembered from the many shots of the famous Shibuya crossing that there was a Starbucks across on the other side so we made our way over there once we arrived. As should have been expected of a shop across from the classic 'crazily busy street'- it was really busy!! So Kate instead got a zero calorie jelly and a 'nuts for you' flavoured ice cream from Baskin Robbins while I got some sandwiches from a convenience store. We had a little look around for a bit before coming across another Ootoya restaurant and decided to have that as a late half lunch and dinner. This time I got the chicken katsu and a bowl of veggies (with no extra chicken) and Kate got a chicken katsudon with an egg. Since it was Sunday and we thought we might be able to see some people dressed in weird fashions we jumped back on the yamanote line and hopped off again one station later at Harajuku. We only had a super quick look though as we were getting pretty tired and after a short amount of time we headed back to our hotel. When we checked it we figured out where they stored our luggage during the day - in our rooms! So that was convenient. I'm a bit hazy the details of what did after we returned back to the hotel and whether or not we went out again. I think we went back out and played the UFO machines at Akihabara for a bit, unlike last year though we didn't win anything too significant and had trouble finding any good ones to play. I didn't do any more shopping as I was saving that up for another day. After whatever adventure we did have, we returned to the hotel and went to sleep. Tomorrow will be our last day on the rail pass and we'll be using it to go see the snow monkeys near Nagano! I am very intrigued by this cat cafe thing. This is the first time I've heard of it; but I'm seeing there are a few around the world. It sounds kind of cool. I still havn't been to one! !